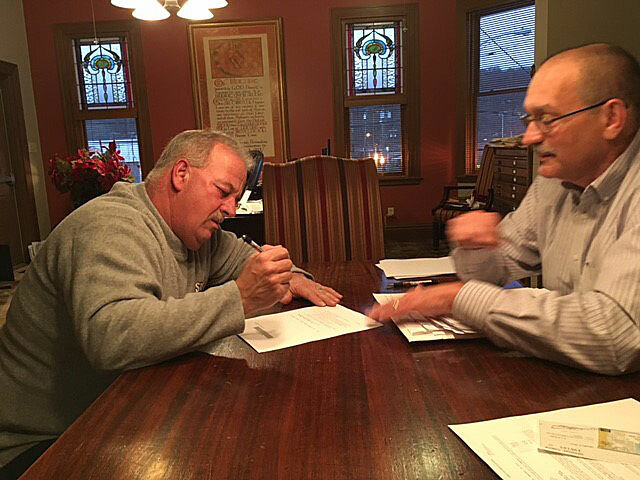 Above, Lewis Farkas signs the papers that make him a new homeowner in Charleroi Borough as attorney Rick Mudrick assists. Last week, Farkas took advantage of down payment and closing cost assistance available in Charleroi through a program funded by the Commonwealth of Pennsylvania and administered on behalf of Washington County by Homestead-based Mon Valley Initiative. To learn more about how homebuyers may be eligible to receive up to $10,000 in down payment and closing cost assistance through MVI, call Jonathan Weaver, housing counselor, at (412) 464-4000 or visit www.bit.ly/charleroi16. To be eligible, prospective homeowners must complete free homebuyer education through MVI and meet income restrictions as well as other requirements. Contact MVI for full details.